A safe DEET free insect repellent for adults and children. Picaridin is a powerful and long lasting insect repellent that does not dissolve plastics and wont damage sunglasses or clothing. Picaridin is safe and pleasant to use on the skin, non oily, practically odourless, and speads easily. The World Heath Organisation recommends Picaridin and describes it as having comparable or superior repellent properties to DEET. 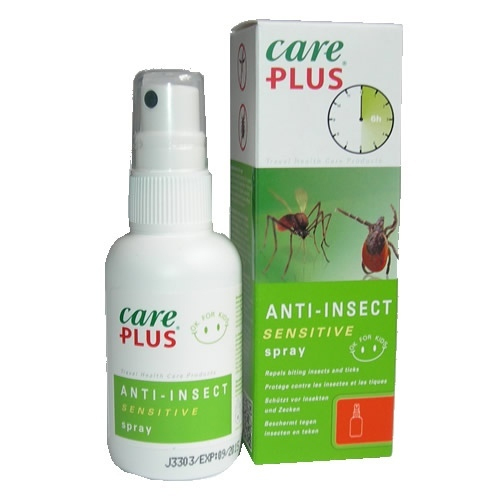 Care Plus Anti-Insect comes in a handy sized 60ml pump spray that easily fits in a pocket or bag for when its needed and should last two to three weeks (if used daily). For adults and children aged 2 years or more.